Joe Nathan Suffers UCL Tear; Who Becomes Twins Closer? Joe Nathan‘s worst fears were confirmed this morning when it was announced that the Twins closer is out indefinitely with a torn ulnar collateral ligament (UCL). Nathan will wait a week or two before deciding on surgery, but rest and rehab is not a normal course of action for this injury. To repair the tear, he would need season-ending Tommy John surgery. This is terrible news to Twins fans and fantasy owners alike. Nathan is not just your normal 30-save closer. He is one of the few, true relief aces in Major League Baseball. Nathan moved full-time to the closer position in 2004. Over the past six seasons, he has averaged 41 saves with an ERA of 1.87. He has also struck out 518 batters in 418.2 innings. Just to show the magnitude of the loss, over the same period, Mariano Rivera has averaged 40 saves with an ERA of 1.90. He has 424 strikeouts in 440.1 innings. So the question is, who replaces Nathan in the 9th inning? Jon Rauch jumps out as a replacement. Acquired mid-season from Arizona, Rauch has the most closing experience of any current Twins reliever. He has 26 career saves and spent most of 2008 as the closer for the Washington Nationals (18 saves). 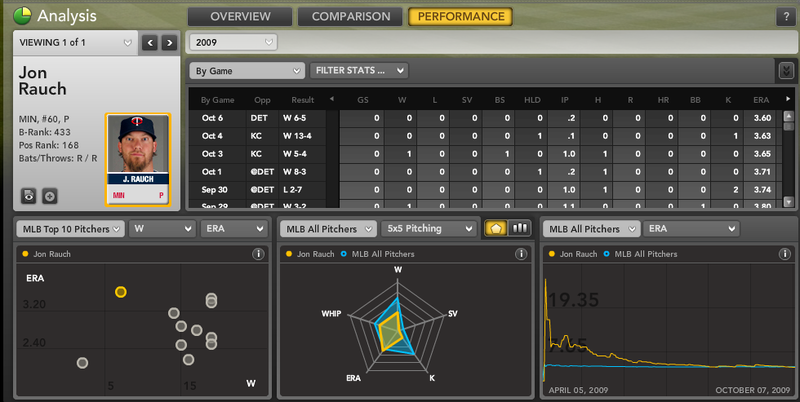 However, beyond the saves and experience, Rauch does not provide much from the closer position. Despite his size (6’11”, 291 pounds), Rauch does not possess a blazing fastball (90.9 MPH career) nor is he an elite strikeout pitcher. His career strikeouts per nine innings (K/9) is a solid but unspectacular 7.4; in 2009, that number dipped down to 6.3. Rauch’s career walk total of 2.9 batters per nine innings is better than average, netting a strong, if not nearly Nathan-esque strikeout-to-walk rate of 2.5-to-1. Matt Guerrier is another candidate. Guerrier has never handled the closing duties before, but has been a decent reliever in the Twins bullpen since 2006. In 389 innings as a relief pitcher, his ERA is a low 3.31. Last season, Guerrier pitched in 79 games for the Twins, going 5-1 with a 2.36 ERA. His 0.97 WHIP (walks + hits per innings) was 10th-best in the big leagues among pitchers in full-time relief roles or more. Guerrier’s 2009 ERA and WHIP were both enhanced by a microscopic, likely unsustainable batting average on balls in play of .222 – well below his career BABIP of .278. Expect some regression here. His WHIP also benefited from a BB/9 of 1.9 last season, that’s much lower than his career 2.8 and could see some regression in 2010. Guerrier does not possess the dominating strikeout rates you would like to see from the closer position. His career K/9 is just 6.0; in 2009, it was an unimpressive 5.5. That said, Neshek was a dominant middle reliever/set-up man before his injury. With a healthy arm in 2006 and 2007, Neshek racked up 127 strikeouts in 107 innings while maintaining a 2.68 ERA. His career K/9 of 10.59 is definitely a plus for any pitcher, and he has walked fewer batters per nine (2.8) than either Rauch or Guerrier. We don’t usually take much stock in intangibles, but own Jonah Keri is a Neshek fan. Need proof? Check here and here. Neshek is a talented blogger as well. Rauch’s combination of skills, health and experience make him our preferred choice right now. Keep a close eye on Spring Training events, though, as Twins Manager Ron Gardenhire may have other ideas. If you draft Rauch, try to back him up with Guerrier and/or Neshek. Track all three to your Bloomberg Sports watch list. For more information on Jon Rauch, Matt Guerrier, Pat Neshek and hundreds of other players check out Bloomberg Sports’ fantasy kits.